A sunroom is a structure attached to a home that affords homeowners a view of the surroundings with protection from the elements. They typically have functional large windows or a pane of glass. Advanced sunrooms offer HVAC packaged and efficient four season wall systems. A solarium differs from a sunroom in a few fundamental ways. Constructed in a “modern” style, a solarium has glass walls and a glass roof. Glass is the dominant feature and allows views of the sky and the surroundings. Solariums can be attached or freestanding structures. They are often seen in restaurants and sanatoriums. They are often more expensive to construct and require more maintenance than a sunroom though both will provide a ROI and years of enjoyment for homeowners. Sunrooms offer unique benefits with little if any extra maintenance for homeowners. Sunrooms are relatively inexpensive additions to a home that allows for more natural lighting and views but keeps out unwanted elements. Our energy efficient windows are specially treated. The windows help to eliminate noise and maintain desired temperature conditions within a home. Reduce home-heating and cooling costs when incorporating our windows within the construction. Natural light is invited into a home but insects, precipitation, excessive heat and even UV exposure are kept at bay. Vitamin D is essential for the maintenance of good health and a daily dose of sunshine is all it takes to meet your daily requirement. The Mayo Clinic reports that as little as 10 minutes of exposure of sunshine a day can prevent a deficiency. There are 2 forms, Vitamin D2 and D3. D2 can be found in foods but D3 is created by the skin when exposed to sunlight. There is no need to take in excessive amounts of Vitamin D. A small amount is all it takes for better physiological functioning. Reduction of the perception of chronic pain, the leading cause of disability, in those that were Vitamin D deficient. There is a significant correlation between inadequate Vitamin D levels and reports of pain and the amount of narcotic medication taken by patients. A sunroom is an investment into your home and into the health of both yourself and your family. Sunrooms are a four season addition to a home. Each season has its own beauty and a sunroom allows for a view and incoming daylight from sunrise to sunset through all of the seasons of the year. Stay comfortable and enjoy the gift of Mother Nature. Advanced Window Products offers soundproofed windows that can be custom-tinted. This application decreases glare and allows for a better view during peak viewing periods. Never have to wait for the right time to plant again. Enjoy an indoor garden throughout the year without the fear of pests and bad weather. Plants are protected year-round from the harshest elements in climate-controlled conditions. Families can benefit from their beauty and harvest. Hobbyists enjoy the exercise and watch the growth of their verdant indoor gardens. It is never too hot, too cold or too wet to garden in your sunroom. A sunroom has all of the functionality of a typical room with added natural lighting and beauty. The addition brings your home to life. The sunroom integrates seamlessly into a floor plan design and creates an elegant statement. The sunroom can be purposed as a family room, gym, artist’s haven, classic dining room with overhead chandeliers and skylights or outfitted with cozy couches and an inviting seating arrangement. Sunrooms are a wonderful addition for larger gatherings. An extra room enhanced with natural lighting against the backdrop of nature invites visitors to linger and relax. Share in each other’s company while dining “not-quite” al fresco or give the teenagers a bit of privacy during their next slumber party. The sunroom draws guests days or night to play, dine or put their feet up. Create the environment that guests crave with a spacious sunroom. The potential of a sunroom is only limited by your imagination. A craving for a cozy family room, private spa, gourmet kitchen, dining room, in-door pool enclosure, attic expansion, master suite or bird observatory can all be met with the addition of a value and pleasure-adding sunroom. 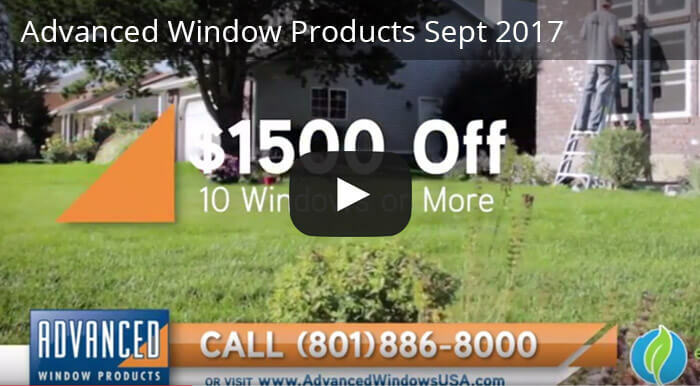 Advanced Window Products is Utah’s #1 window replacement company. Honored with an A rating by the BBB, they are experienced experts helping homeowners make their vision into reality. Advanced Window Products offer 60 months of free financing and $1,200 off with the purchase of 10 or more windows. A sunroom creates a space that brings family closer. Contact Advanced Window Products to invite the outside in and share memories in the sunroom of your dreams.